This summer has been fun and very hot. This is my GoodBye to all of the staff and family and friends from Save The Harbor/Save The Bay. I tryed my best this summer but i enjoy being at work and being around the staff. Hope Everybody has a great back to school for those who are. I will miss everyone!!! Have a great rest of the summer and the rest of 2012 ! Hey everyone Manny here just wanted to post this awesome pick of a mommy lobster. As you can see some of you are probably wondering what is all those black dots on its stomach and tale. Well I will explain as you can see it is very wide and very big all of those small black dots are actually lobster eggs. 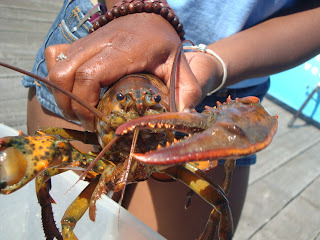 Honestly I wouldn’t consider eating them at all but this type of lobsters are located in Castle Island in south Boston. Sadly we had to throw it back because of it being pregnant but regardless it was a sight worth seeing finding out that it only happens in the summer. 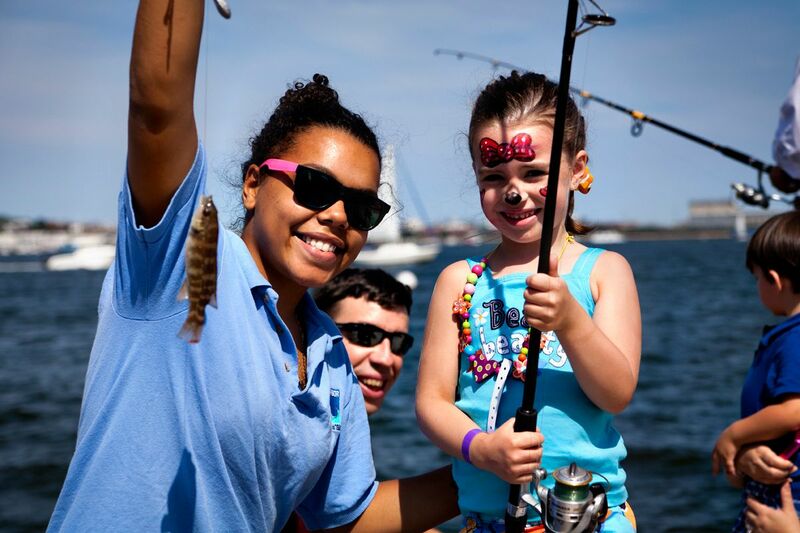 The Vertex fishing event that Save the Harbor attends is probably my favorite weekend event to attend. Its a full day of fun just like any other day at the job but with kids that I never met before. When we fish off the dock we catch a lot of fish although all of them aren't big 45" Striped Bass the kids are happy with their first fishing experience and catching something. We caught a lot of bait fish that had a similar purplish stripped pattern that were very small. Watching people flip off the ICA building was a great way to end the day because it was so surreal. They were doing cartwheels and flips and spins but all in the air in one jump. Red Bull did a great job keeping us hydrated while watching after fishing. Saturday was an overall great day and a good way to wrap up the summer. The best thing this year was every morning it was about, "Ugh I'm going to work." I would think about how I was going to make someones day a whole lot better and prepare myself for the days task. This was an over all better year for me in many ways. I took upon myself to do better and I showed what I was capable of and more. The days went by quick because I worked with amazing children. My past experience compared to this year with Save the Harbor can't be compared. It was a lot of fun working with all the new faces and getting to work with past workers. I definitely want to come back to Save the Harbor next year, it has been a great summer, Thank You. Hello everyone, it's Juelle! It's sad that this is my last official week here for Save the Harbor/Bay. I really enjoyed working here over the summer with very interesting co-workers and spontaneous personalities that people have. I truly enjoyed All Access and majority of the main work sites I worked at. Over the summer I learned how to mature even more and develop great leadership towards the youth and everyone in general. 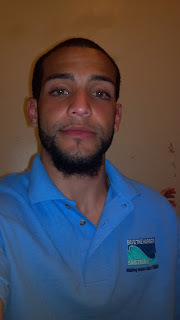 I appreciate this opportunity I got to actually work with Save the Harbor/Bay since I never had any experience in marine environmental science or in cleaning the public beaches/harbors here in my city. I do know that I have learned a lot of cool information from the Senior Harbor Educators and also Lead Explorers. You guys were such a great help. I honestly told myself that my goal was to do things out of the ordinary and things I have never done before. I learned to stick my goal by actually experimenting with different activities such as holding crabs which actually freak me out! Then again, I was proud of myself in the end because I knew I could do it and just believe in myself. I really had a lot to reflect from since I worked for Save the Harbor/Bay. All in all, this has been a summer to remember! Thanks for everything! Hey guys, today at the Children's Museum was actually a relaxed day. I interacted with a few families and visitors this morning and enjoyed talking to them about crabs and our organization. 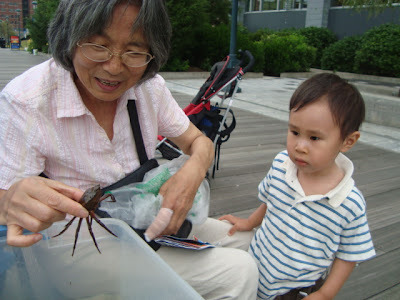 To add on, it was fun seeing infants and toddlers getting excited and fascinated by the green crabs my co-workers found in the harbor today. We found approximately 15 green crabs all together. Here's one visitor that was a bit scared at first to touch the crab but after a while he started to become interested in them which was great ! 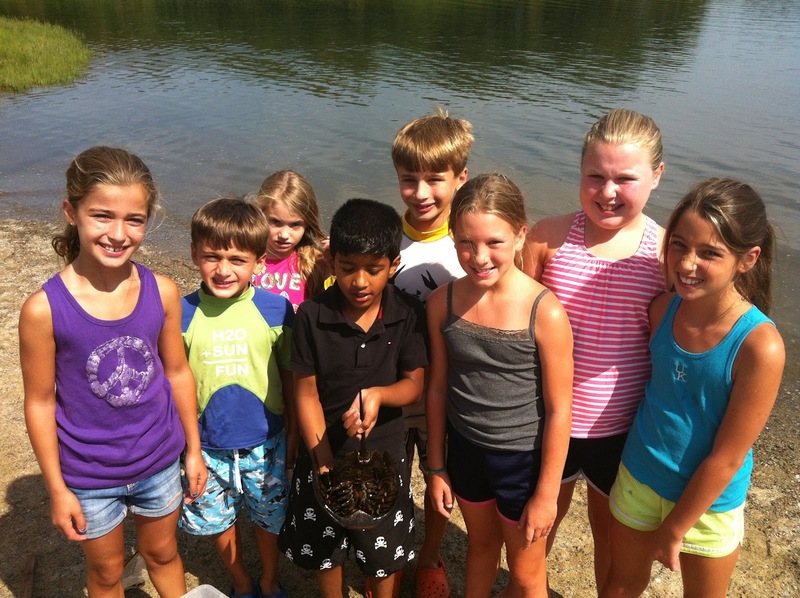 He was a such a brave kid and he actually touched one of the crabs my team found! 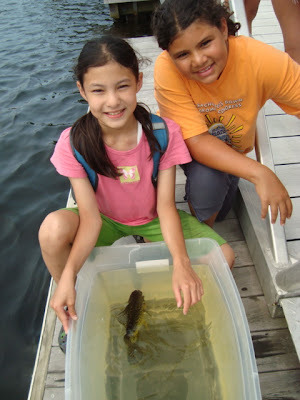 Also, my co-workers taught visitors how to fish and as soon as they grasped it they loved it! Here's a picture of Manny and two employees from the Children's Museum bonding! I also took a picture of a visitor and Manny teaching him how to fish. He really enjoyed fishing with us. You can tell he enjoyed Manny's company and had a great time with Save The Harbor/Save The Bay. I'm glad my team and I made our visitors engaged and interested in the green crabs and fishing as a way to start off their day. I love making people have a good time and learn something an awesome organization like us. Later !! Southie is notorious to us Save the Harbor workers because we always catch lobster there. The kids get upset when we don't catch enough lobster. George and Abby where eager to walk on the beach because every time I go to Southie I usually take the kids there and I wasn't at McDonough a lot this summer. We caught comb jellyfish, a few hermit crabs, and a lot of Asian shore crabs. The Comb jellies really fascinated the kids because we didn't see any jellyfish this year they were replaced by striped bass and lobster. This was a great year but the kids didn't get a chance to pick up the dead jellyfish although they can sting you when dead. Well my friends, the time has arrived. As summer programming comes to an end, I find myself on this last day reminiscing about the past 2 months, and also wondering what lies ahead! This summer has been a great one, and being given the opportunity to spend every single day outside has been incredible. I think my favorite part about this summer has been watching the kids' faces when they discover something new and exciting, and sometimes unexpected! 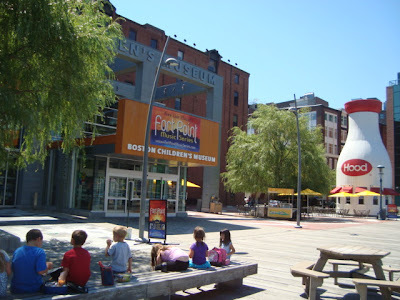 Each day, I began my mornings by arriving at the Boston Children's Museum. The beautiful skyline greeted me across the Fort Point Channel, and overall sunny skies were present for the majority of this summer! For the most part, we had different visitors stop by the touch tank everyday. I would say about half were locals, while the other half were visitors from overseas, which always made conversation fun and enjoyable! 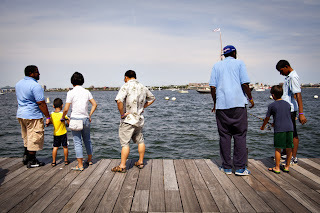 Hearing all of the different accents reminded me of what an attractive and desirable city we Bostonians get to call home, as families and individuals from all over the world come here to explore the city and surrounding areas. 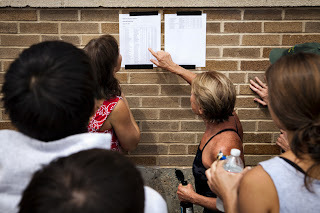 In addition, there were also a handful of returning faces that I loved to see -- kids with their parents, grandparents and babysitters who would stop by at least once a week! This explorer visited 3 times in one week! 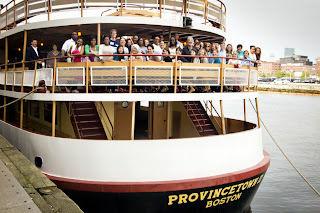 My afternoons were spent up at Community Boating Inc. along the beautiful Charles River. Despite providing a calm and relaxing environment, the Charles also carries with it this vibrant energy that easily draws one in. C.B.I. never got boring, as there was always something to do! We were fortunate enough to be placed with a sailing instructor from C.B.I., who helped us throughout the summer and had access to the kayaks and sailboats! The kayaks were a great mode of transportation to get us up and down the river, and allowed the kids to explore their surroundings and any creatures that lie above them in the trees, in the plants along the river bank, or even below them in the river itself! 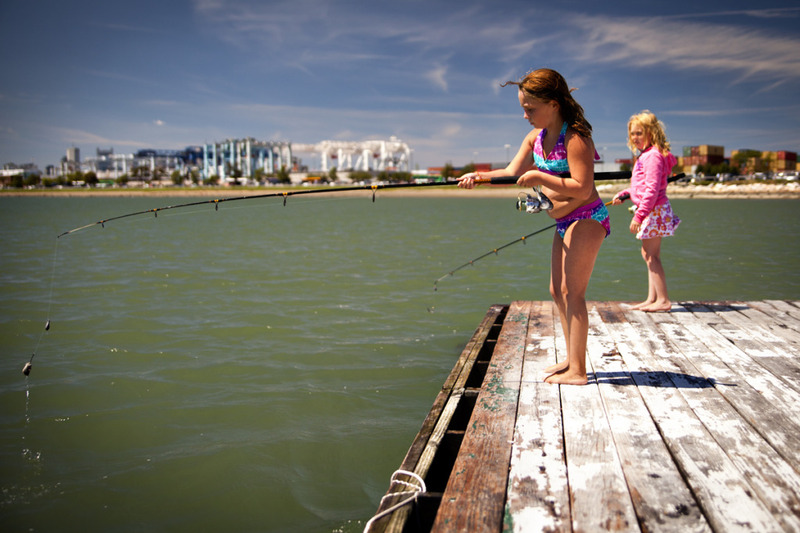 On some days, we let the kids bring a few fishing poles right out on the sailboats as well. The kids loved this, and especially loved the opportunity to show off their sailing knowledge and skills to all of us. 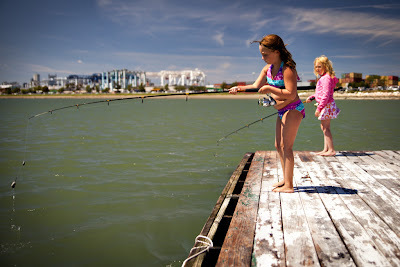 However, fishing was the kids' favorite activity by far. Despite not catching a carp, the kids' patience was awarded with plenty of sunfish, a couple bass and even a perch! It was always interesting to discuss the concept of carp cookies to new faces. For the most part, the kids were crazy about getting their hands dirty with the flour, water and sugar combination! C.B.I. was a great way to end my day everyday, and I'll miss being there everyday for sure. Spending this summer with curious young people and a great high school team has made it an exciting one, and it's crazy to think that Labor Day is right around the corner. I want to say Thank You!!! to everyone at Save the Harbor for giving me this opportunity this summer, and especially to the junior assistants who I had the pleasure of working with everyday. It was really nice getting to know each of you, and I wish you all the best for the future! (Or for next month, whether it be school, a new job, or some other exciting adventure!). My only parting advice is this -- be ADVENTUROUS. Find the desire to explore; to see new places and meet new people from other communities/cultures. 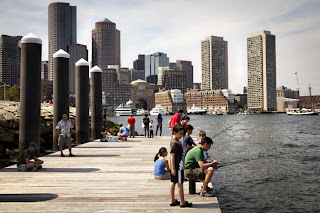 Boston may be wonderful (trust me, it is my favorite place to be and to call home! ), but other new and different places are out there. Basically, what I'm really trying to say is don't be afraid. I like to view life as an adventure, but in particular one that always involves the sea! Today was really an unexpected day at the Children's Museum. My co-workers and I found a huge lobster today and a lot of green crabs. What was so interesting about the lobster we found was that so many visitors from the Children's Museum were so fascinated by it ! 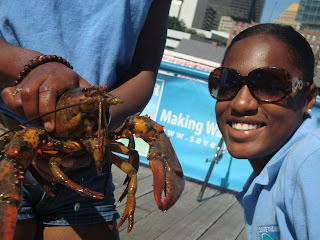 This is the first time I experienced catching a lobster in the harbor right at the Children's Museum. The adults as well as the children were just so interactive with us and asked many questions about the green crabs. I'm not really a fan of holding crabs and being so free spirited with them but today I came out of my comfort zone by holding crabs! It's really not my thing but I told myself this summer that my goal was to do exciting things I never done or experienced before. How can I start, this beach party was the best! Everybody did their part in making this beach party the best! It was a nice way to end the summer. I had to be on the grill, grilling all the hot dogs! Carolyn, Andrew, Leon and myself where grilling in one of the grills. Leon and Andrew grilled the hot dogs and Carolyn and myself had to but them in the hot dogs buns. I never seen some much hot dogs in my life! Before lunch time the Kids and all the staffs there were there all ran into the beach at the same time, now that was fun. I didn't get to do it this year because I was grilling but seeing everybody else was good feeling. There were so many kids like 200+ kids! 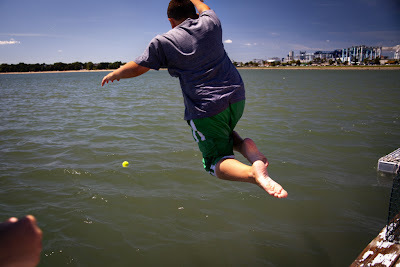 There were different activities like: sports, fishing, kites, art, sand castle and Boston Harbor Explores which was the best one because we had TWO BIG LOBSTERS, when I mean BIG they were BIG! When I took the biggest lobsters out to walk around and show the kids, the faces the kids put when they seen how big the lobster was. It was priceless! After all the playing around, and enjoying the weather the beach party came to an end! Some of the Save The Harbor/Save The Bay staff got into the water which the water was really COLD! Then we had to clean up which it wasn't as messy. Hey guys, what's up ? 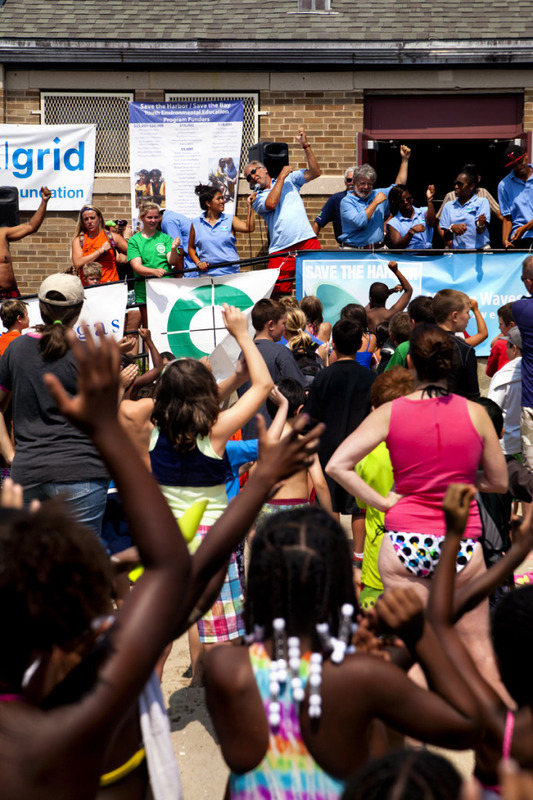 On Friday my team and I threw an annual beach party in South Boston for nearly over 600 kids. Isn't that unbelievable ? We had fun activities for children to participate in and interact with us. There was a sports station, arts, sand castle , fishing , kites and as well as exploring what Save The Harbor/Save The Bay. 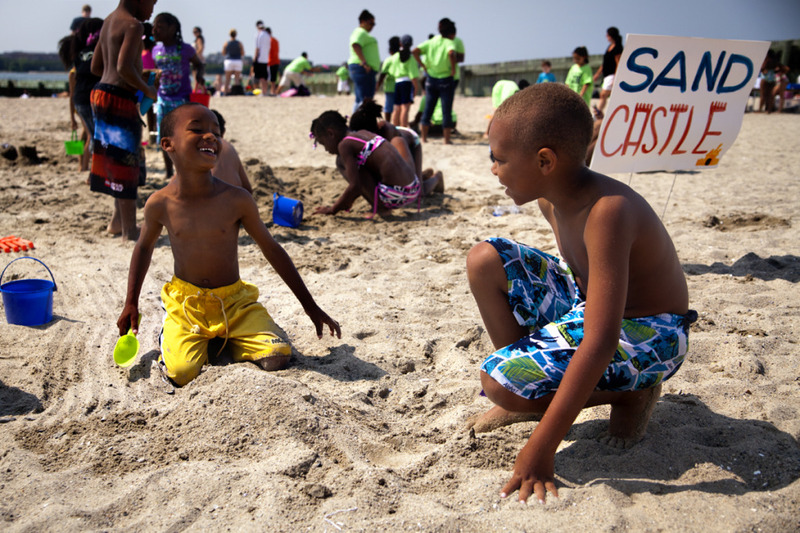 It was very touching to see over 600 kids actually enjoy themselves and have such a great time with Save The Harbor/Save The Bay! The children were so fascinated by all the buckets and shovels for building sand castles! They were so excited to create their own since they have imaginations. The beach bash was such a blast and definitely turned out to be an awesome event. I really love to see kids enjoy themselves ! 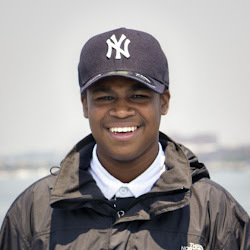 Greetings, everyone - Mike Murowchick here, Save the Harbor / Save the Bay policy intern and photographer-in-chief. On Sunday, August 19, Save the Harbor / Save the Bay hosted the Swim for Boston Harbor, a championship chip-timed competitive swim on M Street Beach at the BCYF Curley Community Center in South Boston. This year, nearly 50 swimmers aged 9 - 64 took part the race, which raised almost $5,000 for Save the Harbor / Save the Bay. 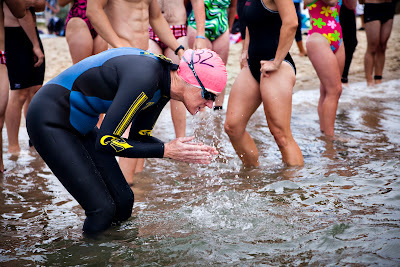 Here are a few of the photos I took at the swim. I hope you enjoy looking at them as much as I enjoyed taking them! You can see more in Save the Harbor's swim album on PhotoBucket . Katie Odair of Watertown, MA, splashes her face with water in preparation for her swim. 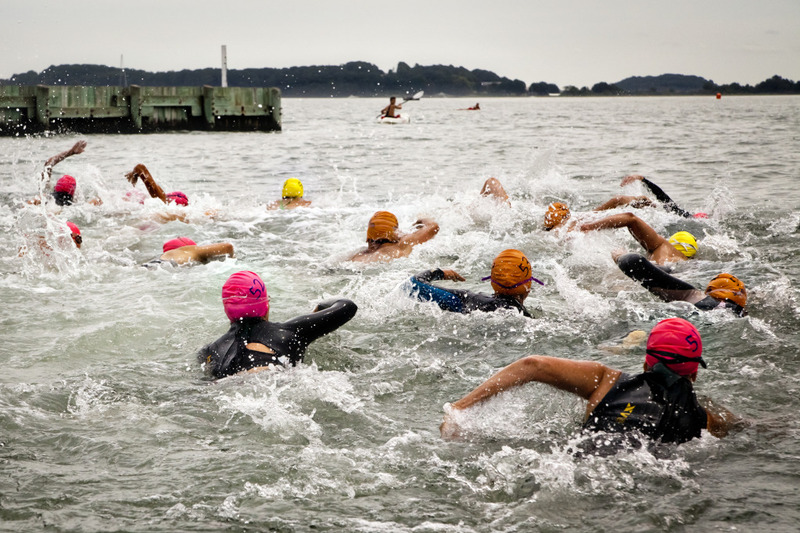 All 43 participants make the plunge into the 68 degree water as the race begins. The swimmers make their way towards the first buoy marking the beginning leg on the 1 mile course. 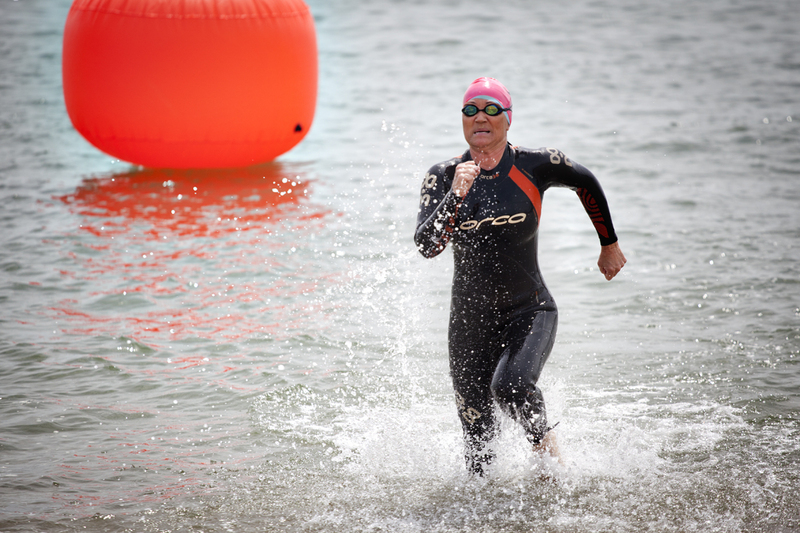 A swimmer makes a triumphant emergence from the water as she sprints towards the finish line. before enjoying an icy cold Harpoon Beer on the beach. I'm Rajani, the new development coordinator here at Save the Harbor. I fell in love with the organization right from the beginning -the more I learn about the programs the more excited I get! Everyone here has been so warm and welcoming, I already feel like part of the family. Just this weekend I got to partake in one of my first events, the Swim for Boston Harbor at the Curley Center. 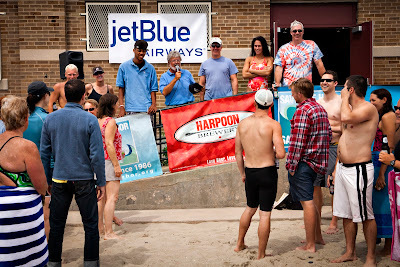 More than 44 swimmers registered and solicited donations for the one mile competitive swim, which culminated with the winners receiving a pair of round trip tickets from JetBlue Airways and a beach bash with ice cold Harpoon beer for participants and supporters. A huge thank you to all the swimmers for coming out and showing me how its done and to our sponsors as well! 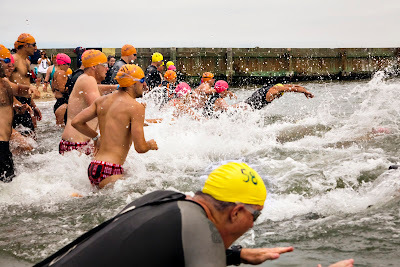 Ten years ago the swim was cancelled because the water in the Harbor was unsafe for swimming. 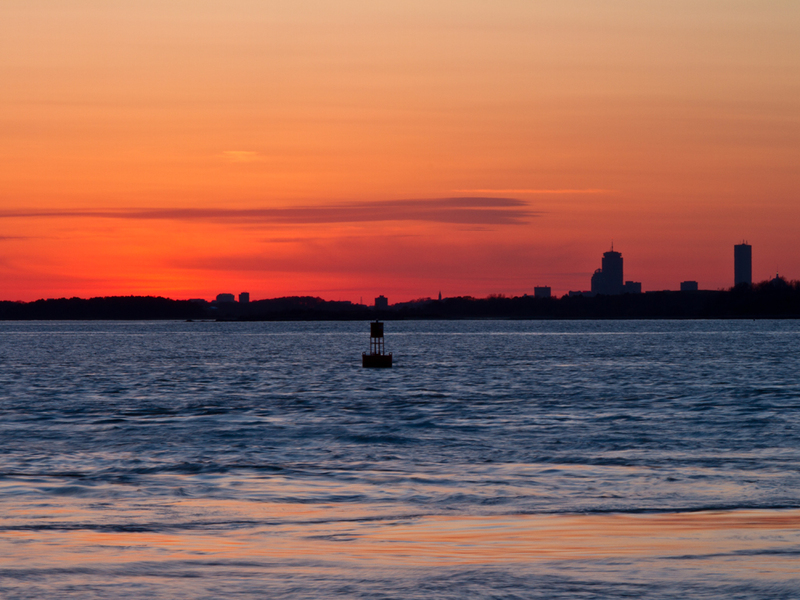 After tenacious advocacy work, the beaches in South Boston are among the cleanest in urban America. 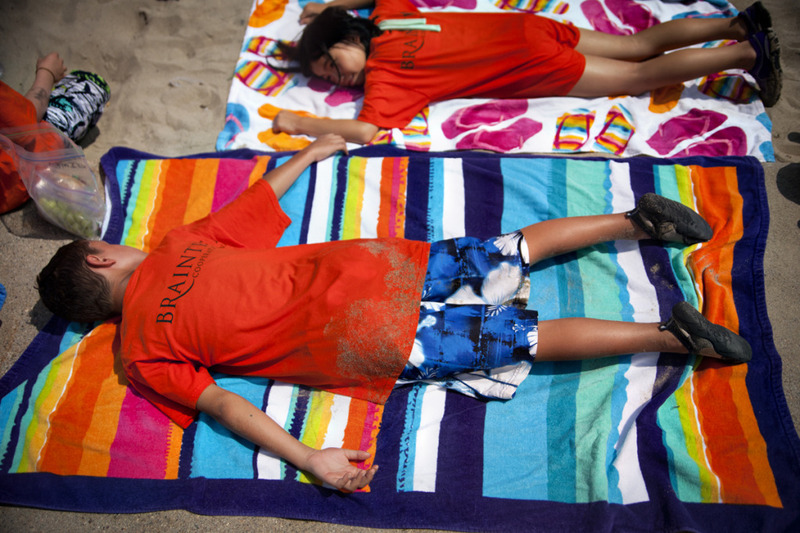 Participants from over a decade ago returned to M Street Beach (some with their children) to celebrate the victory of the Boston Harbor clean-up. It was nice to see that the beach was not just a happening place for swimmers but also for family and friend spectators who came to cheer on the race and enjoy our beautiful beaches. 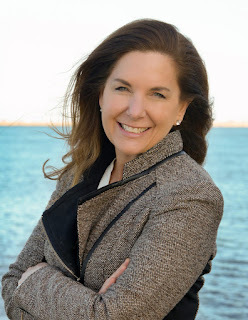 It always amazes me how generous Save the Harbors supporters can be. 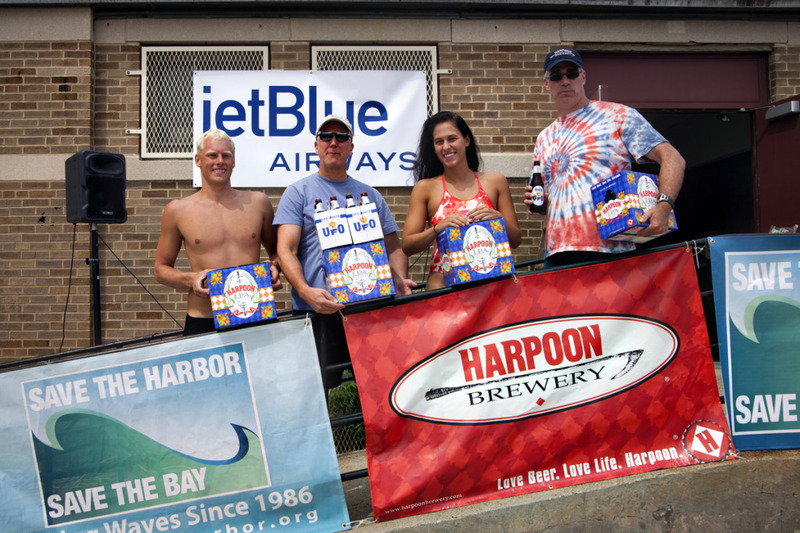 Jet Blue graciously donated round trip tickets to the winning swimmers while Harpoon donated free beer for the after party. Fred Ahern, the Director at Boston Centers for Youth & Families gave up one of his last Sundays of summer to help us out as did Greg O'Connor, the Race Director from the Boston Light Swim, who came to provide his expertise and bring florescent swim caps. Thanks to all who donated, participated and joined in the celebration. Congratulations to the winners of the Swim: Annie Adams, took first place in fundraising while Brian O’Neil of Decature, IL won the men’s wetsuit competition and the Jet Blue Airways tickets. Congratulations to Katie O’Dair of Watertown who won women’s wetsuit category as well as Randy James of Sudbury and Caitlin Fee of Brighton who braced the 68 degree water and took first in the the men and women’s non-wet suit competition, respectfully. We are so grateful to all of our supporters and donors.I look forward to working with you all in the future! Hey everyone on August 17, 2012 the Save the Harbor/ Save the Bay staff enjoyed a day with all the camps of kids that we have taken on All Access Boston harbor with us this year. We were just celebrating the time that was spent during the summer together, what we have learned, and having such a BLAST ! 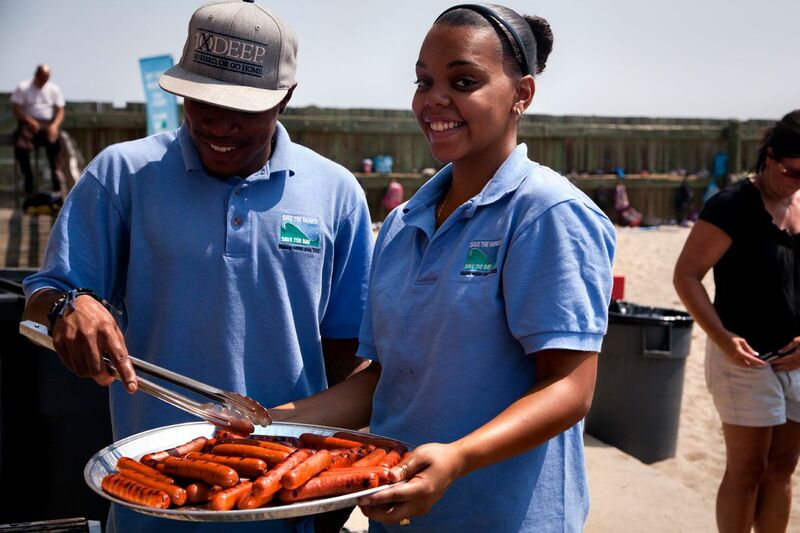 This was my first beach party with Save the Harbor / Save the Bay and it was quite an experience considering all the things we had to do to prepare to cleaning up at the end of the day. I was put at the Art Station with Thi and Carly. 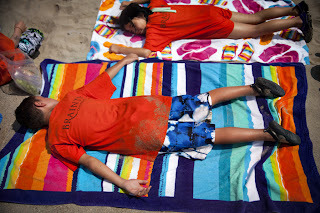 We had so much fun watching everyone soak up the sun while we had the only shade on the whole beach. 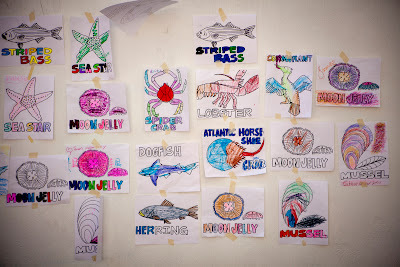 The kids had a chance to write their names on a scale to put on the big fish we drew out and to see how many of them actually participated was incredible. After that was done we got to color and hang up the artwork whether it was finished or not. We learned that the kids really enjoyed themselves and that it was another experience they can say that Save the Harbor / Save the Bay actually did an awesome job with if I may say so myself. Despite it being so hot that day was fun to resist the erge to get in the water or cool off anyway until Bruce announced the big SPLASH ! The splash was a huge relief. This last Friday, I arrived at the Curly Community Center ready to begin this amazing last day for the groups that were coming. I knew many individuals in each of the groups since they had all been to All Access at least once. I set up the art station in between the white expansive walls and began to prepare myself for the onslaught of kids who would run to me to put a scale with their name on it on the huge striped bass I had drawn. Just as I finished up setting and sat down for a breather in the shade, I could see from the gate that there were kids in green t-shirts running to the art station. Here is David coloring in a lobster! 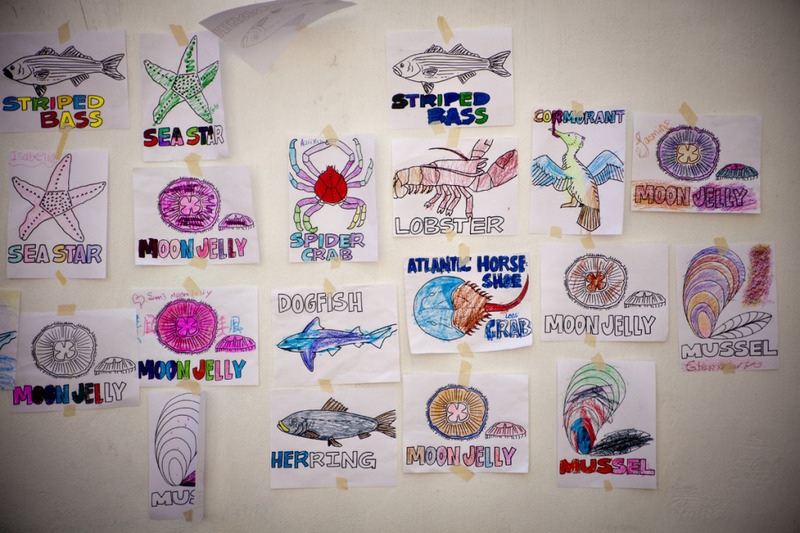 By the time it was nearing lunch time, many of the kids didn't want to bring their papers with them so they asked Bri, Carly, and I to put them up on the wall so the other kids could see their artwork! Here is a collage of just some of the amazing pieces the kids made. I had so much fun with all of the kids and I can't believe it was almost the end of the summer. It was a bittersweet ending, but I can't wait to see them next summer! 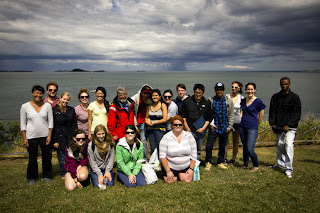 It's that time of year again -- All Access is done for the summer, the summer sites are wrapping up for the summer, and it's time for the staff to say their goodbyes. Every summer goes by so much faster than I think it's going to, and it's because of all of the cool people I get to work with on a daily basis. I won't be forgetting this year's staff anytime soon. All of the interns, plus the high schoolers from Blue Cross Blue Shield and the MLK Program, have been great to work with on the boat and make my day much more fun. Since this is my third year on All Access, I recognize a lot of the groups that come out to the islands with us. Seeing the kids experience the harbor and all that it has to offer makes me appreciate what a great job I have: being a part of a memorable day for thousands of children from across the city. 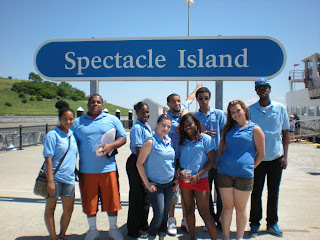 And for those of you who are wondering, All Access took 5,056 kids to Spectacle and Georges' Island this summer! 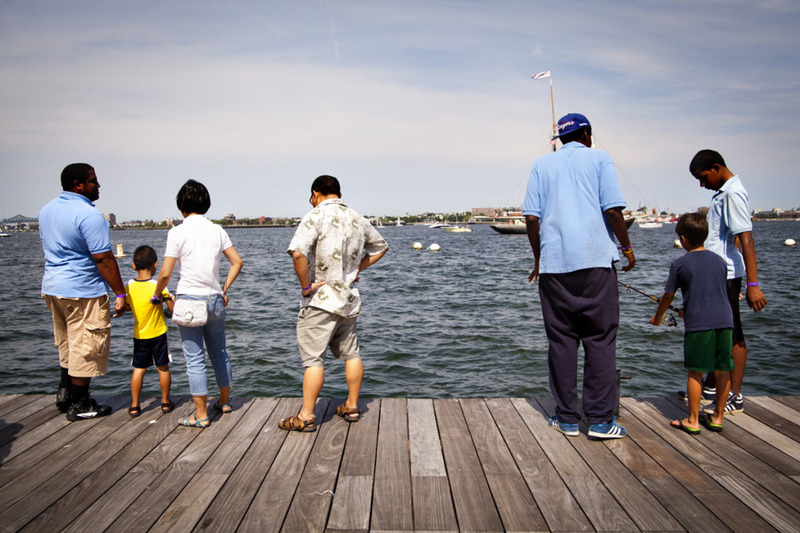 Every summer Save the Harbor is part of some pretty cool events. 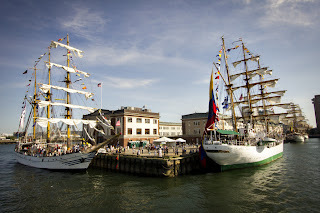 This year was the first time that I saw the Tall Ships that docked in Boston the first week of July. 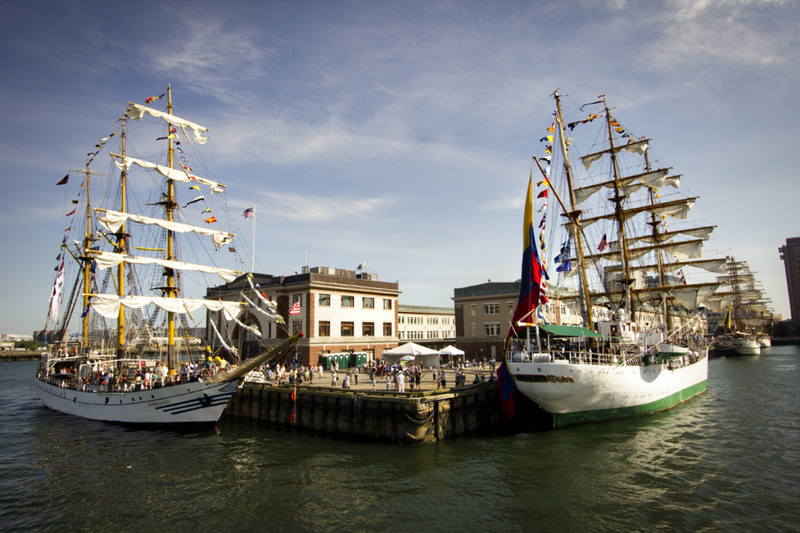 Talking to the Colombian sailors and seeing the beautiful ships up close was such a unique experience, that I would never have been a part of if not for Save the Harbor. 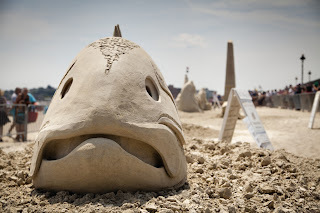 Another of my favorite events is the Revere Sand Sculpting Festival -- every year the artists come up with crazier and crazier designs! 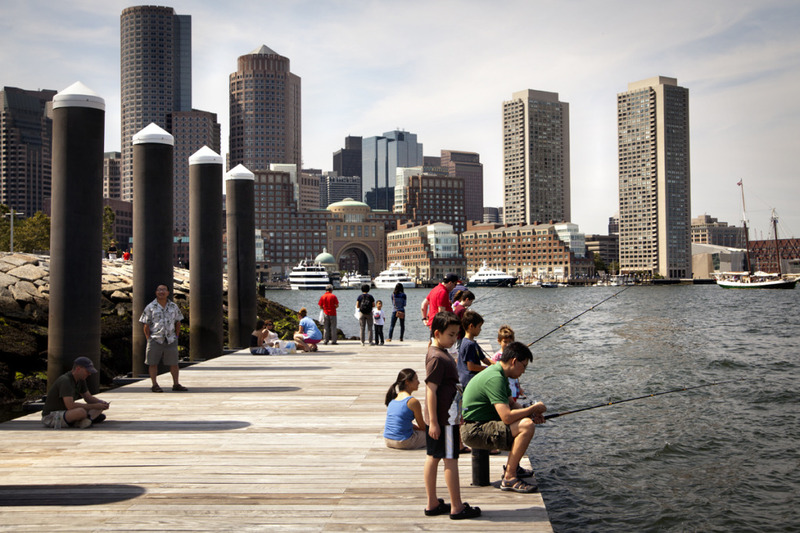 Every year, we learn about how much the harbor has changed for the better in the past 26 years. 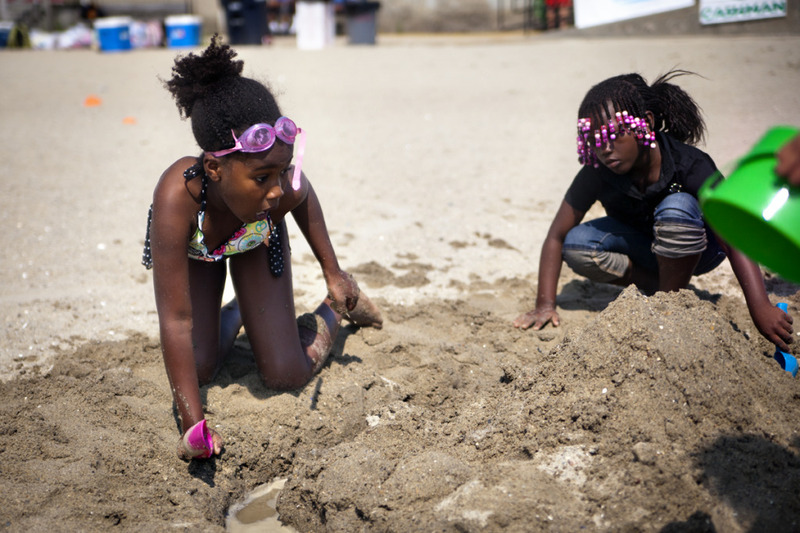 Beaches that used to be filthy are now clean and home to fun programs for children and adults alike. 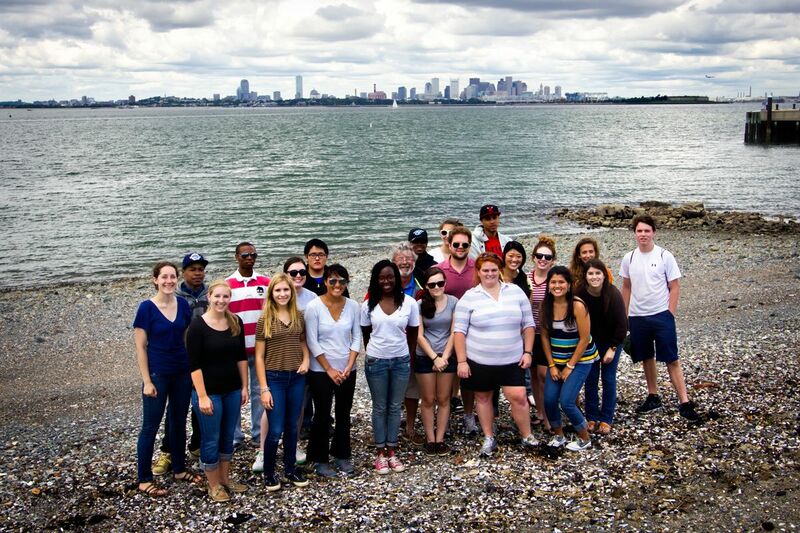 Working closely with community groups all over Boston, I've seen first hand how a clean harbor can positively influence someone's life; I feel lucky to have been a part of an organization that looks to protect the ocean and islands for the next generation of harbor explorers. Save the Harbor's second annual Beach Bash was last Friday at M Street Beach -- over 600 children from across Boston came to South Boston to have a day of sports, sand, and swimming! We had a beautiful day, and some great entertainment! After a jam-packed morning of playing on the beach the kids got to here some great songs from our very own David "D-Money" Coffin and Will "Big Willy" Clark. 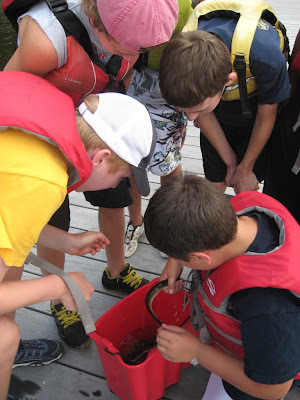 Kids and counselors alike sang and clapped along to the old-fashioned sea shanties and raps. 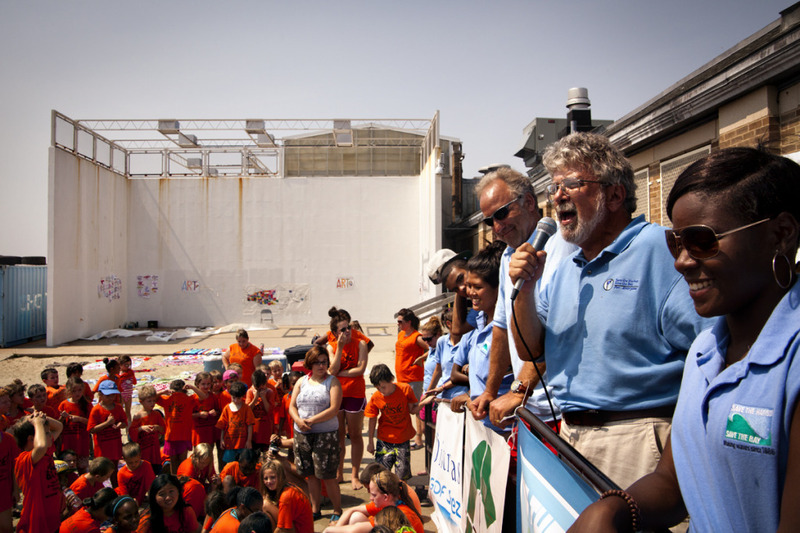 Bruce Berman, Director of Strategy, also had a few words for the kids about how much Save the Harbor has done to clean up the harbor and beaches. 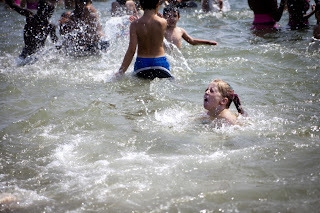 At noon, everyone "splashed" into the water at once -- over 700 Save the Harbor staff and youth groups!! 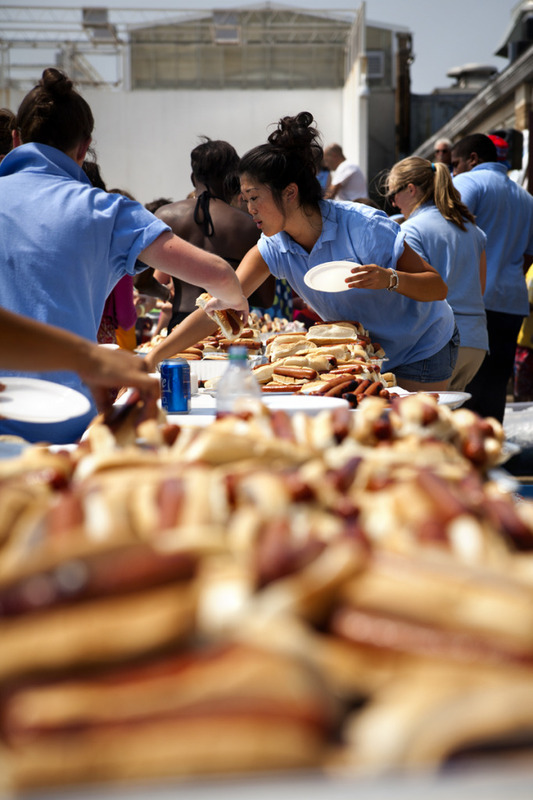 I was on hot dog duty, so after the splash I was overwhelmed with children and counselors looking to grab a hot dog, cold drink, and some fruit after a morning spent running around the beach. 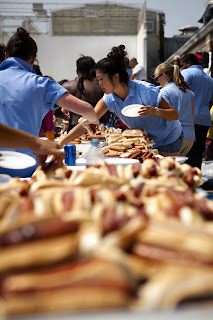 Not to toot my own horn, but I made some mean hot dogs...and lots of them. Having so many kids on the beach at the same time is definitely overwhelming, but in a good way. It was especially nice that so many of the groups had come out on All Access at least once this summer, so I saw lots of familiar faces -- I even took the bus down to M Street beach with Paige Academy, one of the our favorite groups at All Access! 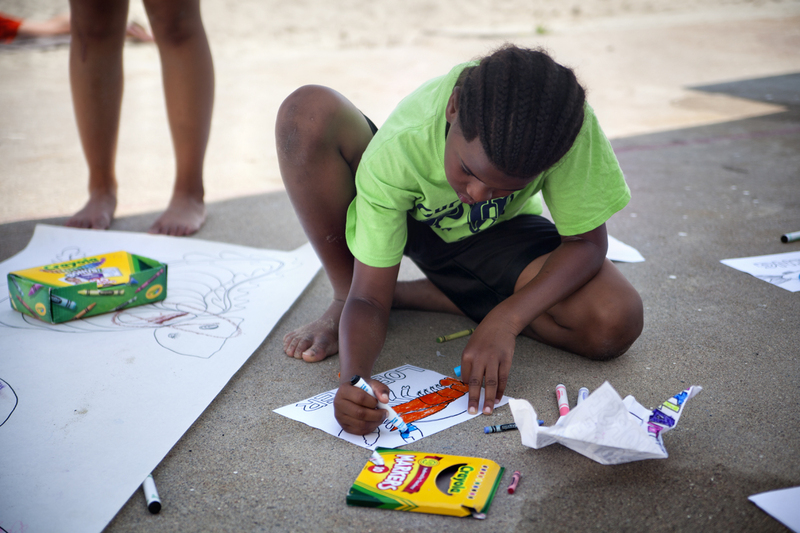 Spending the day at the beach made for a great Friday, and a great end to most of our summer programing. And I fully expect the third annual Beach Bash to be even more amazing than this one! PS: Another one of my favorite pictures from the Bash! The summer went by much faster than I expected and now the sun is setting on my time at Save the Harbor. I got to enjoy Top Secret sandwiches, fileting fish and spending time in the office with some great people. 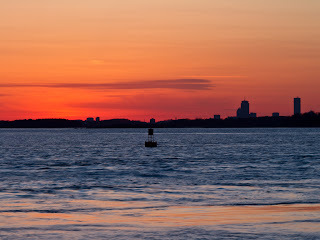 I have a new respect for the Boston Harbor and all it has to offer thanks to Save the Harbor Save the Bay. See you later.